bl.uk > Online Gallery Home	> Online exhibitions	> Asia, Pacific and Africa Collections	> Baber Shah's Musjid [Kabul]. in Kabul, Afghanistan, reputedly built by Babar, the founder of the Mughal dynasty in India, during the Second Anglo-Afghan War (1878-80). Burke, who accompanied the British forces into Afghanistan during the Second Afghan War (1878-80), made use of the opportunity to become the first significant photographer of the topography, archaeological sites and people of Afghanistan. These photographs were later sold in albums in Britain, known as the 'Afghan Albums'. Zahiruddin Babar (1483-1530) was a prince of Farghana (a valley in central Asia), who having tried unsuccessfully to conquer Samarkand, the capital of Timur Lang (Tamerlane), was forced to flee over the Hindu Kush into Afghanistan, where he made himself ruler of Kabul. With Kabul as base he ventured into India, defeated the Afghan Sultan of Delhi in 1525 and established the rule of the Mughals. Although busy in India until he died, Babur loved Kabul and embellished it with buildings and gardens. The city flourished from his time, and while he died in Agra and was buried there, in 1597 his body was brought back to be interred in Kabul in the garden south west of the city which came to be called Bagh-i-Babar. 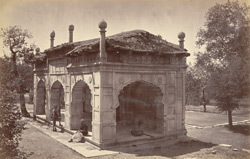 The mosque, erroneously attributed to Babar, is much later in style.